Very true: breathtaking trek. Ideal for visitors who don´t want to spend to much time in the mountains or for those with a only a couple of days available. Transport Huaraz - Cashapampa (3000 m). Hike to Llamacoral (3650 m). Distance: 90 km (transport). Hiking 9 km. Llamacoral - Alpamayo basecamp (Arhuaycocha Valley) - Taullipampa (4250 m). Taullipampa - Punta Union pass (4750 m) - Quenual Pampa (Huaripampa Valley, 3700 m). Quenual Pampa - Vaqueria (3000 m). Transport Vaqueria - Huaraz. Private transport from/to your ho(s)tel. Donkeys & donkey drivers. Approx. 7 kg per client. All camping equipment and cooking/eating utensils. 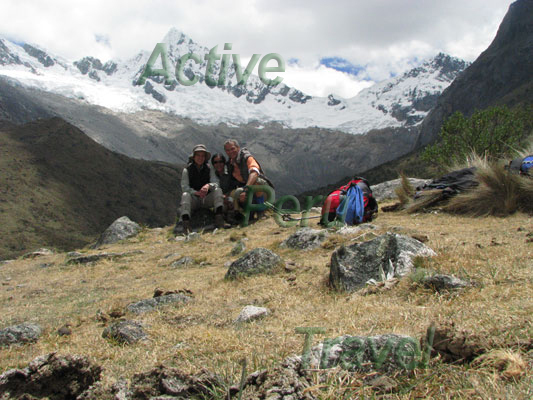 The quality of the tours sold in Huaraz (99%) are not at the level of our minimum requierements (general quality, proper payment of staff, sudden extra costs, unwanted surprises, ...). In order to organize a trek properly, get one of the better guides etc. it is very much recommendable to book well in advance. Needless to say that left-over guides, cooks,… are not usually the best. For these reasons, to start a new group departure, you have to book at least 4 weeks in advance in order to give us a chance to look for more participants over the internet. We can also organize transfers, hotels in Huaraz or other cities, packages in the rest of the country etc. If you would prefer more services, from the airport in Lima for example or a complete Peru travel package, please let us know. 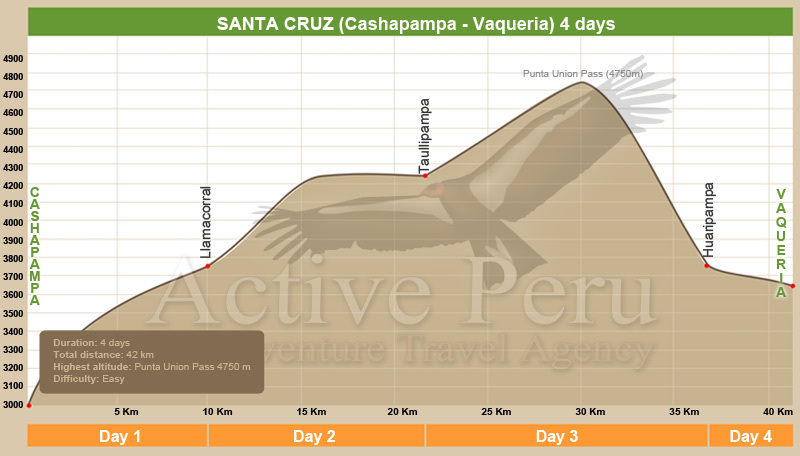 We recommend at least 1 full day (2 nights) on altitude before starting the trek. 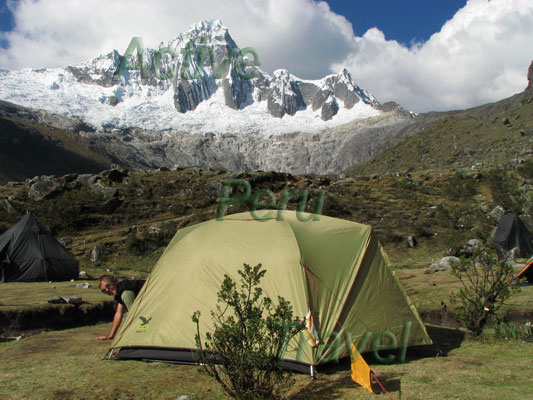 If you have been on altitude in the South of the country before (Colca Canyon, Puno, Cusco – all on altitude) or in Huaraz you shouldn´t consider this anymore and might as well go to the trek immediately after arrival to Huaraz. Punta Unión Pass (4750 m), Santa Cruz Trek – Cordillera Blanca. Camp Taullipampa (4250 m), in the background Mt. Taulliraju – Cordillera Blanca/Santa Cruz Trek. 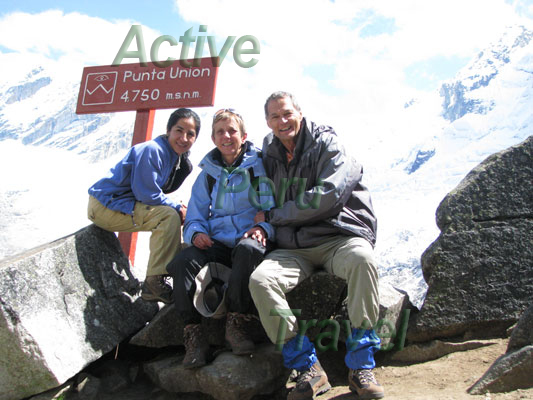 Viewpoint “Mirador de Alpamayo” – impressive view to mighty Alpamayo (5947 m) and Quitarraju (6040 m).